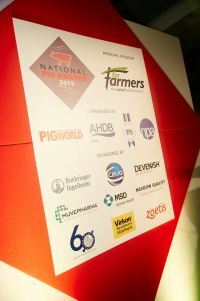 ForFarmers were the principal sponsor for the 2nd National Pig Awards at the Royal Garden Hotel in London. The event is regarded as one of the major occasions in the UK pig industry calendar and sees producers and members of the Allied Industry Group meet to celebrate best in practice and innovation in the UK Pig Industry. The National Pig Awards ceremony welcomed 370 guests who heard a state of the industry address from banker Martin Redfearn, HSBC and were entertained by comedian Ian Moore. As part of ForFarmers’ commitment to support the pig industry and producers, the company has been the principal sponsor of this flagship event since its inception in 2014, providing an opportunity for the company to promote itself, its values and products as well as emphasising its commitment and support for the pig industry. In his speech, Jonathan Farnhill, Director of Pig, Poultry and Speciality Products, commented on the brilliant work undertaken by the industry groups as well as praising the excellence and resilience of UK pig producers. “These awards recognise all that is good in the pig industry… from production excellence, innovation in the process, commitment and hard work allied to a willingness to help as well as encouragement, development and training the next generation of pig producers,” commented Jonathan. The prize giving grew considerably this year, seeing a growth of 20% in award entries, coupled with a 50% increase in attendance at the awards dinner. This demonstrated the popularity of the event and ForFarmers’ association and support which did not go unrecognised by the industry. The prize giving also offered a great opportunity to promote VIDA, ForFarmers’ new range of piglet starter feeds. Alan Dedicoat, Voice of the UK’s National Lottery and hit show ‘Strictly Come Dancing’, auctioned one tonne of VIDA Ultima 3 which raised £1000 for the Farming Community Network Charity and squeezy ‘VIDA’ pigs were given to guests. The event also allowed for networking opportunities among producers and ForFarmers’ technical experts and account managers. Many of this year’s finalists were customers of ForFarmers. Additionally, the company sponsored two main categories for awards - outdoor and indoor producer of the year -and recipients received their prizes from Jonathan Farnhill, Business Unit Director. Rick Buckle, of RC&VE Buckle, Hull, won the overall producer and indoor producer of the year award and Roger Newton of North Farm Livestock, near Holt, Norfolk was presented with the outdoor producer of the year award by Jonathan. “It’s a great honour to win the award,” commented Mr Buckle. “It’s superb to see so many people from the pig industry here, and we’re chuffed to bits.”.